The WorldVeg Best Practice Hub (BPH) in Madiira Farm, Tanzania trained a new group of farmers to take on the challenges of finding and meeting local market demand for fresh produce. To help increase the capacity of their staff in food value chains, a group of 9 Catholic Relief Services staff visited the World Vegetable Center in Tanzania on 21 August 2017 as part of a five-day “Horticultural Learning Journey”. Success from vegetable farming can come only if farmers know where the markets are, have sufficient skills to manage their crops well, and are willing to work with other players in the value chain such as traders, input suppliers, and transporters. VINESA graduates will need cooperation from the business community to succeed in putting their new farming skills to work. 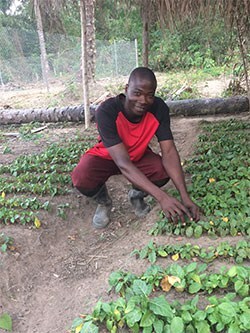 VINESA: Improving income and nutrition in eastern and southern Africa by enhancing vegetable-based farming and food systems in peri-urban corridors. Young farmers trained in vegetable production and marketing by VINESA in Tanzania pool their collective knowledge about agribusiness.